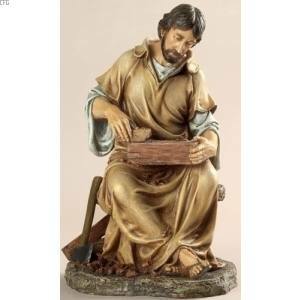 This detailed depiction of a carpenter is reminiscent of the work done by St. Joseph and Jesus in their own workshop. This statue is a great reminder of the dignity of work for all people. This is a great gift idea for a carpenter, or for anyone who is hard-working, as St. Joseph and Jesus surely were! The statue is crafted from a resin-stone mix and stands 10.25" high. It comes boxed.